Kevin Dufour’s original hockey plans didn’t include playing collegiately in the United States. Like many Quebec natives, he planned on playing in the Quebec Major Junior Hockey League and perhaps Canadian college hockey. But once he starting learning about U.S. college hockey, the more he thought it was a viable option. Dufour eventually committed to Bowling Green, and he has been a contributor since his first game with the Falcons. This season, the sophomore left wing leads the nation with eight goals and is tied for the lead in power-play goals with three. He has a goal in every game for the Falcons, 4-1-1 overall and 2-0 in the Western Collegiate Hockey Association. The next challenge facing BG comes Friday and Saturday when it hosts 13th-ranked Minnesota State (4-2, 2-0) at 7:07 p.m. The Mavericks were the coaches pick to win the league championship this season. Dufour’s success also is the result of clicking on a line with classmates Pierre-Luc Mercier, who plays center; and Matt Pohlkamp, who plays right wing. In addition to Dufour’s eight goals, Mercier has a goal and five assists, and Pohlkamp has a goal and four assists. The three also played together at times last season. All three have good size — including the 6-foot, 195-pound Dufour — and are able to control the puck down low in the offensive zone. By doing so, they’re able to generate scoring chances. And the three live together, along with classmate and goalie Tomas Sholl. Dufour and Mercier also were roommates last season. Dufour has been a scorer throughout his career, including the 2012-13 season when he had 26 goals and 32 assists for Carleton Place, Ontario, in the Central Canadian (Junior) Hockey League. He then had a solid freshman season at BG, totaling nine goals and seven assists in 37 games. He missed just two games, Nov. 1-2 at Alaska. Dufour was one of BG’s best players down the stretch, totaling five goals and two assists in the final 10 games. He also earned ice time on the power play. While he has produced offensively, Dufour is working to improve his defensive and play without the puck. He had an on-ice rating of plus-6 last season and is plus-1 in six games this season. “I want the coaches to trust me so they can play me in every situation,” Dufour said. “Last year, I had to get used to the system, but this year is easier because I’m used to it. I can just go out there and play and have fun. It’s a lot more simple. Dufour also has increased his strength over last season and is in better shape. Dufour and Mercier, who is from Verdun, Quebec, were discovered by BG assistant coach Ty Eigner. The two were at a prospect camp in Montreal run by Clarkson assistant coach Phil Roy. Falcon head coach Chris Bergeron said Dufour and his Quebec high school hockey teammates eventually took a 12- to 13-hour bus trip to BG to learn about the Falcons and U.S. college hockey. Dufour and Mercier are the first Quebec natives to play for the Falcons in almost 30 years. 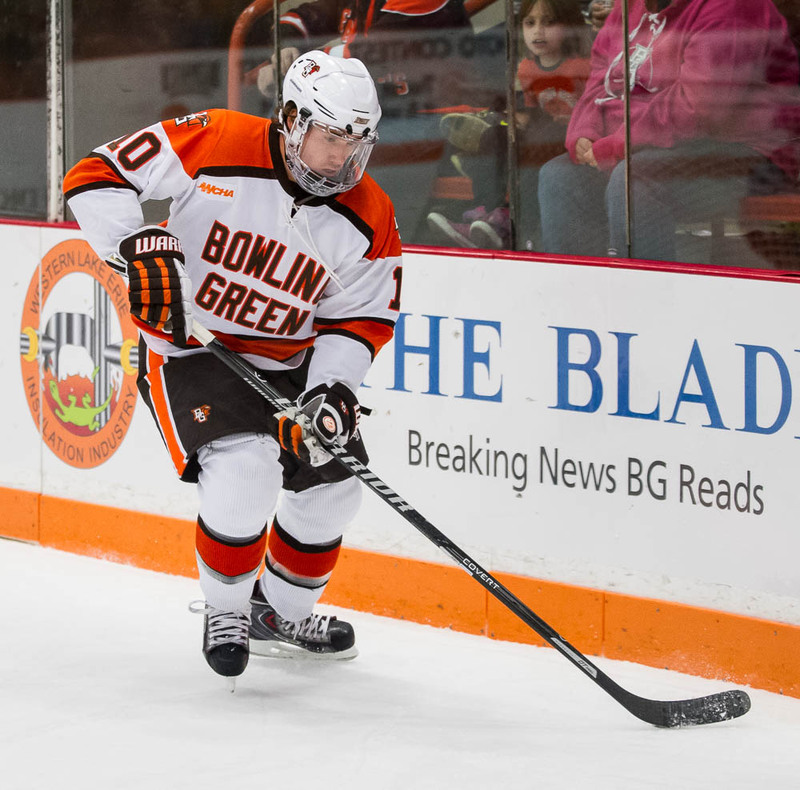 Mercier was a late recruit, visiting BG in the summer of 2013 and committing to the Falcons in the middle of July. “Over four years, we’ve had to look in non-traditional places,” Bergeron said of BG’s recruiting. “Ty and Barry (assistant coach Schutte) have done a great job of working hard to build relationships in a lot of different areas. Dufour, who is fluent in French, is steadily learning the English language. He took an English program during his season with Carleton Place. The Minnesota-born Pohlkamp and the California-born Sholl also are helping Dufour and Mercier with their English. Dufour is developing a cult following with BG fans, thanks to his eight goals. He already has a Twitter account named for him, @ChurchofDufour. The #ChurchofDufour has become a hashtag, too. Earlier this week, Dufour’s girlfriend chided him on Twitter for not having a Twitter account, even though #ChurchofDufour already was trending. Bergeron said Dufour has improved his defense this season without his offense suffering.